This collective of 11 Dismember trademark songs might just not be enough. Although, thumbs up for being true to the fans and to themselves. Their music keeps on going, like an everflowing stream. Reviewing Dismember is tougher than one might think. I decided to review this one because I know this band so well, thought it would make it so easy to pour out the right words. I was wrong. "The god that never was" is so typically Dismember one could just write: "This is the new Dismember album and it is awesome!". But there is this slight difference, a subtle new feel and atmosphere around it. Their pace feels heavier, it sounds darker, and their approach almost exhaustingly aggressive. Yet, before I even heard the first note on their new album, I knew totally what to expect - Death Metal! The title track "The God that never was" begins with a fast tempo, introducing their old-school guitar sound and drum beat that is just Dismember. The guitars sound incredibly raw, while being driven by a massacring drum beast. Matti sounds more pissed than ever, yelling through the speakers, his voice taking shape of a napalm wave. The pace doesn't stop, it just keeps on going in this utmost headbanging death metal spirit. Shadows of the Mutilated continues the massacre with even more aggressive vocal thunder, until it steps into a more melodic part followed by an impressive harmonic guitar lead. While mentioning the solos, it really shows a positive progression within their music, being technically skilled, while maintaining the classic Swedish feel. Total Death metal goes on uncompromisingly with another powerful, fast paced, though melodic Time Heals Nothing, while the guitars shred the lower tones on Autopsy (most likely a tribute song). Short but effective, Never forget, never forgive is a fast and a brutal intermezzo with it's duration less that 2 minutes. 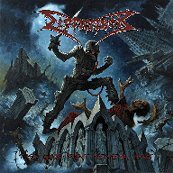 Speaking of short songs, Dismember took a bit more mainstream approach (in the terms of average song duration), not really going into epic lengths, which makes the whole album quite short. 35 minutes best, with 11 tracks. Well, I guess it is better to make it shorter than boring. Plus, every song on this album is pushed to the maximum. One might wish to hear slower tunes with "The God that never was", but Dismember have no desire on keeping it slow or mellow, it's either Death metal or... well, it's just Death metal! But, we all know Dismember can get quite sorrowful and melodic sometimes. And even this time, they freshen up their menu of pure death brutality with a fine dose of melodic twin guitar leads, which give the songs a more passionate and powerful feel. Overall speaking, the album is great! No Dismember fan (or any Death metal fan) will find a glimpse of disappointment with "The God that never was", but for those who are musically a bit more demanding and look beyond the undisputed fact that Dismember are sitting on the very throne of Swedish Death Metal, this collective of 11 Dismember trademark songs might just not be enough. Although, thumbs up for being true to the fans and to themselves. Their music keeps on going, like an everflowing stream.